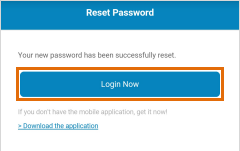 How do I reset or change the User Password of an Extension on my Office@Hand mobile app? 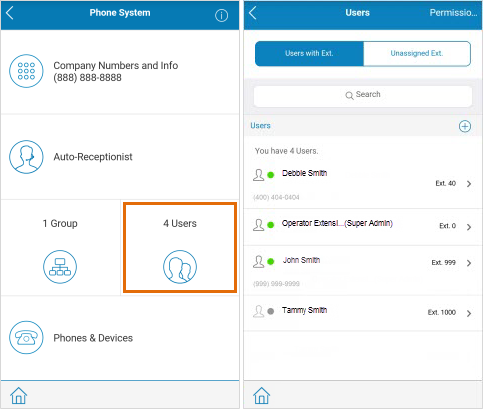 Resetting or changing the Password, PIN or Security Question may be done using the Office@Hand mobile app. Click on the links below to know how to change another user, or your own security settings. 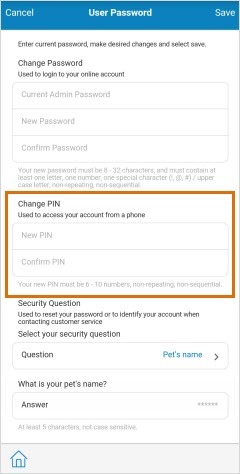 Follow the steps below to change your Password, PIN or Security Question. NOTE: If you are no longer able to log in to change your extension’s Security Settings, you can have your account Administrator change your password or click here for steps on how to reset your password. 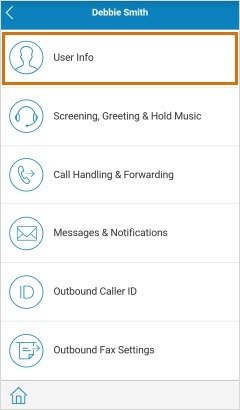 Launch the Office@Hand mobile app. 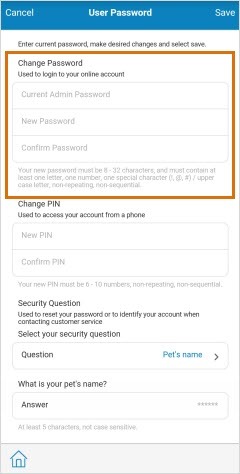 Enter your Current Password, and then your New Password, PIN or Security Question. 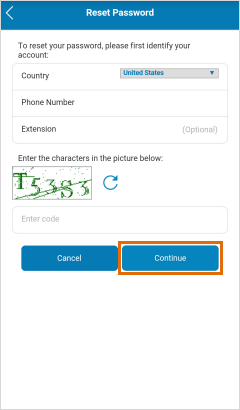 You also have the option to change your Security Question and Answer. 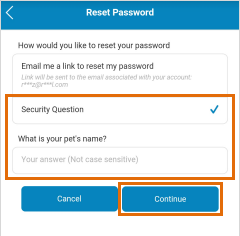 To do this, click on the drop-down list to select the security question and fill in the answer field. Tap Save to confirm your changes. Follow the steps below to change another User’s Password, PIN or Security Question. Tap Users, and then select the extension that you wish to modify. We will select Debbie Smith on Ext. 40 as an example. 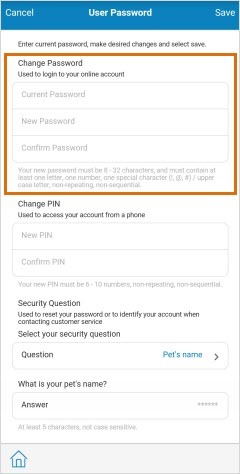 You also have the option to change the User’s Security Question and Answer. To do this, click on the drop-down list to select the security question and fill in the answer field. Tap Save to confirm the changes made for the User. If you are no longer able to log in to your Office@Hand account, follow the steps below to reset your password. 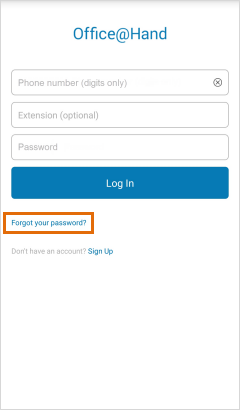 In the Office@Hand mobile app’s login screen, tap Forgot your password. Enter your Office@Hand Phone Number, your Extension Number (required if you do not have a direct number), and the characters that will be provided by the system. a. Email – Tap Email me a link to reset my password, and then click Continue. If you choose this option, a Password Reset Link will be sent to your extension’s Contact Email Address. You need to access your Email and click on this link to reset your password. b. 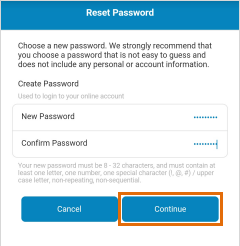 Security Question – This option will allow you to reset your password immediately. 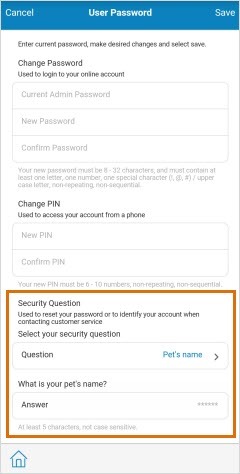 Tap Security Question, enter your Answer to your extension’s security question, and then tap Continue. Enter your New Password, and then tap Continue. You will see a confirmation that your password has been successfully reset. Tap Login Now to login using your new password.